Industry leading read distance up to several feet depending on reader quality and environmental factors. Meets standards established by the International Committee for Animal Recording, the worldwide organization of animal recording and productivity evaluation. Conforms to standards established by the International Organization for Standardization the world’s foremost developer of standards. Ensures security in livestock management programs. Guaranteed to last the life of the animal while protecting the technology inside. Ensures lifelong retention while eliminating infection and disease transfer. 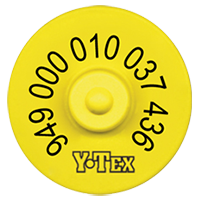 The Y-TEX RFID Tag is ISO 11784 compliant employing full duplex and half duplex technology. The transponder is encapsulated in a weather-resistant polyurethane material. 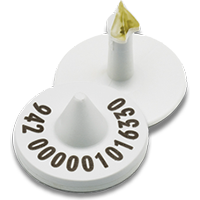 The female cattle RFID tag weighs only 6 grams and the sheep/swine weighs only 4.2 grams. 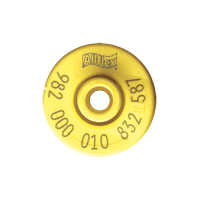 Y-TEX RFID tags provide superior read distance, retention and durability. The tags are applied using the Y-TEX UltraTagger plus or UltraTagger compact. Also Available: as matching Ear tag/RFID tag sets. Extended Small Males are used for placement in a deeper location in the ear. 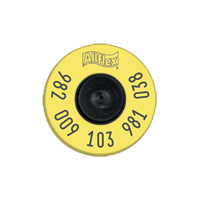 Apply with Allflex Universal Total Tagger (Red) or Allflex Ultra Retract-O-Matic for EID tags. Also Available: in models for sheep, goat, and swine. As well as matching ear tag/RFID tag sets.